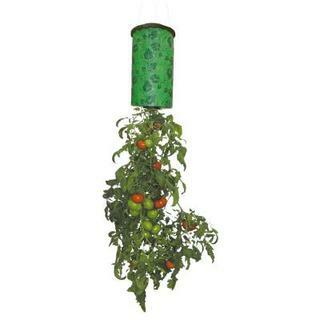 I've seen those hanging pots that allow tomato plants to grow down and without the cages. Does it work? Pros vs. Cons? definitely need something low maintenance, and out of the way of curious kiddos. Any ideas when is a good time to plant in the Central TX area? I have some tomato seedlings enjoying life on a window sill. I planted them in January. I expect to transplant them mid march - but you have to look at the last average freeze date for our area (I think it's around March 20th?) Depending on the weather, I will plant the spring garden the second half of spring break (after March 17th.) The nice thing with the containers is you can bring them in with out too much trouble if it's too cold. I am going to plant some tomatoes in the ground and try both of these hanging contraptions. My 11 year old wanted to see if there will be a difference between the topsy turvy and the coco mat container. I just hope we get a lot of tomatoes! Definitely want to try this... Have little kids who are always picking my tomatoes right before they&#x27;re ripe, so maybe this will keep it out of their reach a little better... will post success or failure later this summer! This method actually does work really well as long as you make sure to keep the soil watered! The first picture above is from &quot;topsy turvy&quot; and although it is not the cutest thing in town, it is cheap $10-$13 and easy. If you want something more decorative you can purchase a hanging coco basket in picture #2, cut a hole in the bottom, plant your tomato plant upside down and fill with soil. Hang it up and you can even plant herbs on the top of the basket to help retain moisture. I love the look of the coco basket - what a neat idea, I think I even have a place I could try this.... I am all about garden experiments. Especially when it comes to tomatoes! !